Raw diet is excellent for dogs that have allergies. DISCLAIMER: Von Der Musikstadt is not a Veternarian or health care professional. The Information I have on this page is my own personal X-rays photographed by my Verernarian. 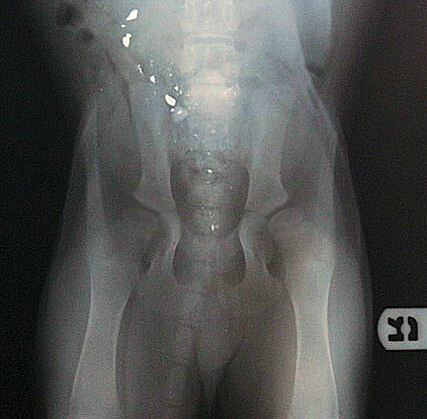 There are hundreds of web sites that show X-rays for a reference. The pictures below are owned by Rosann Bentley. Do not use these pictures unless you link back to our website as a reference. This is a set of hips at 10 weeks old. 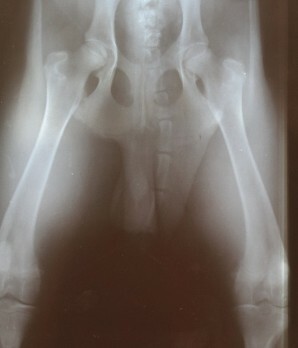 You can clearly see the pelvis is in 4 pieces. The separation is on each side in the sockets. Another separation is at the lower pelvis bone. 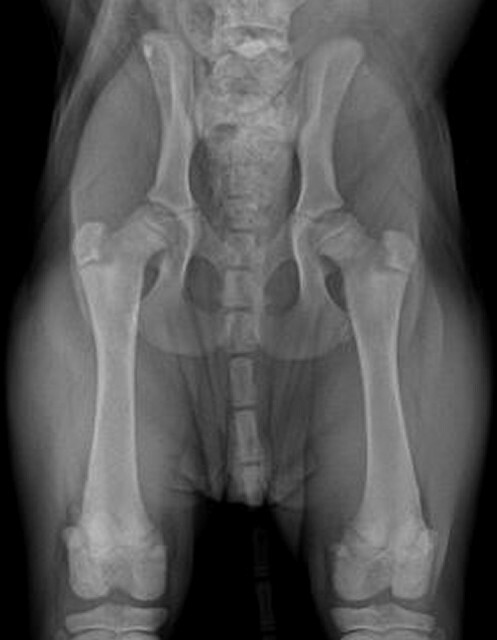 You can clearly see the hip sockets have not formed yet. The sockets are starting the shape for the head of the balls to fit. Also the balls are starting to form. This is why it is EXTREMELY IMPORTANT to not allow your puppy at a young age go up and down stairs and bang around the hips. Do not let your puppy jump off your coutch even though you think it is cute. You will regret it later when you are spending 3000 each side to replace your dogs hips or be a mean owner and let your dog SUFFER! This is a set of hips at 4 1/2 months old. 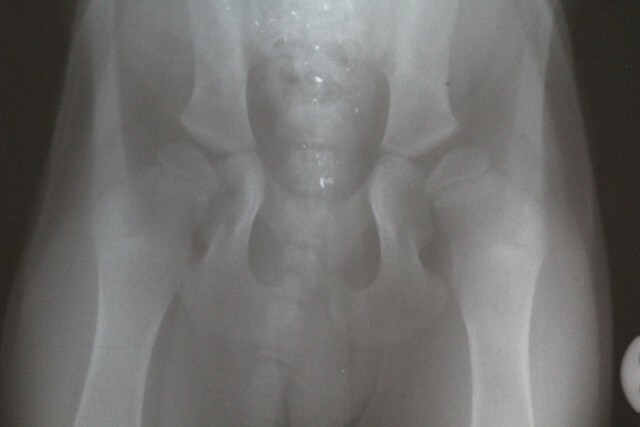 You can clearly see the pelvis is in 4 pieces. The separation is on each side in the sockets. Another separation is at the lower pelvis bone. You can clearly see the hip already has a sever case of dysplasia. In most cases you take a xray at 6-9 months old, but this puppy was turning out his leg to compensate. As he got older it was more painfull. 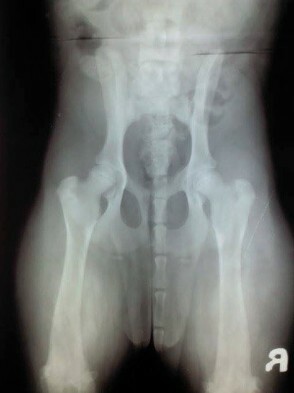 The puppy was examined my Colarado state and a penn hip was done. 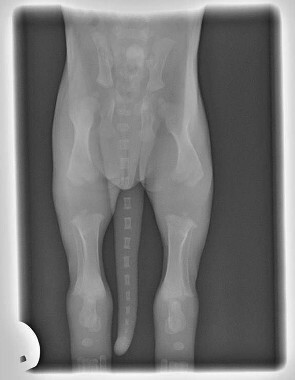 I have not personally seen a puppy at this age have a problem until the xrays was sent to me and reviewed. 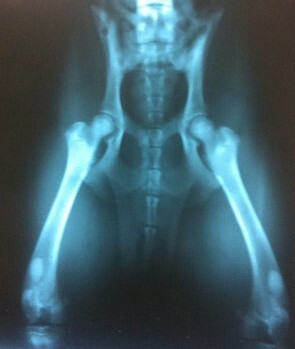 At 4 months old a puppy's set of hips look almost complete. The pelvis is still bonding and forming 1 piece. The only thing you cannot see is the cartalege that hold in the joints in the sockets. 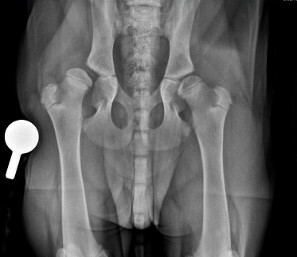 Positioning is not great but you get a idea at this age if your dog has good hips. If you are deciding to become a ethical breeder. 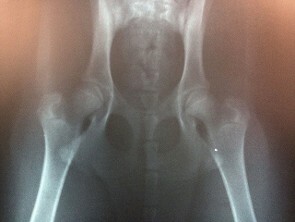 You need to check the hips around 6-8 months old. This will determine if the dog is good breeding quality.